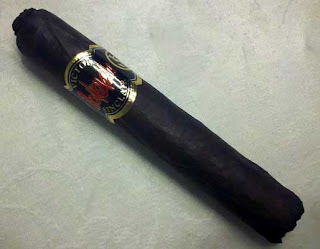 This is another stick from the Bohemian sampler with an Oscuro wrapper. 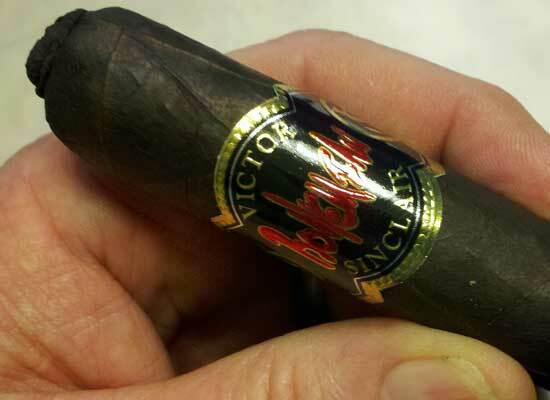 A nice looking, well constructed cigar with nice looking dark wrapper, a top knot and a shaggy foot. I thought a few days in the humidor would help these even out, but as I found out while smoking this stick, it either needed a great deal more humidor time or there was a major flaw in the internal construction. Once the top know was removed this cigar had a nice sweet and spicy cold draw and a spicy aroma. 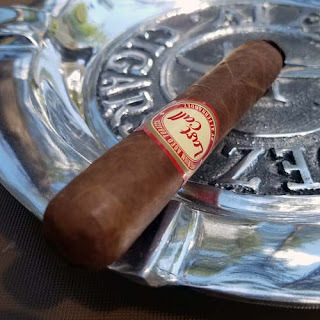 Since it came with the shaggy foot and a nice easy draw this stick was a breeze to light and started off with the same sweet spicy flavor as the cold draw only more intense. After the first inch or so the cigar started to heat up clear up by the ring and the barrel of the cigar started to shrivel a bit. I cut this cigar down to where the barrel had shriveled and found that the burn, even though the burn appeared even, had taken off and burned out the center of the cigar nearly full length in only a few short minutes. Again I am not sure if this was a humidity problem with the cigar or an internal flaw in the construction but since I have a new humidor arriving next week I will give the rest of the sampler a couple weeks to even out a bit before trying another. I did find these offered online in a sampler if five different sized for $2.99 per stick. I'm very disappointed that I didn't get to finish this stick, I think it would have been a real gem.